Disclosure: I was provided compensation by BEHR to write this post but the thoughts and opinions expressed are my own. It’s time to jump full steam ahead into the holiday season! Yesterday I shared a precious memory of my sister and her favorite Mexican Wedding Cookie recipe. 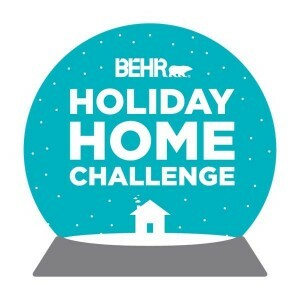 Today I’m joining my fellow Behr Paint bloggers in a challenge to come up with an original outdoor project for our homes. 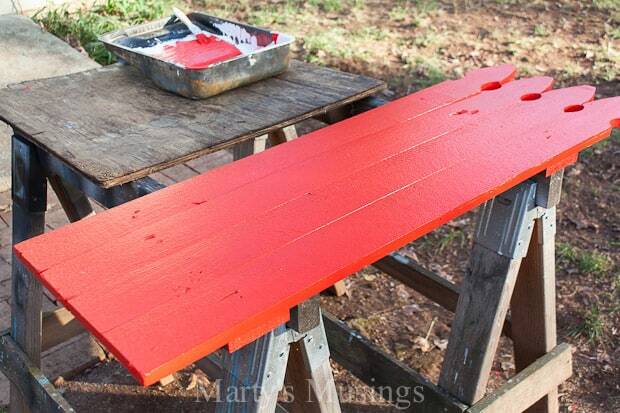 Is it any surprise my DIY hubby and I teamed up to create a new fence board sign? 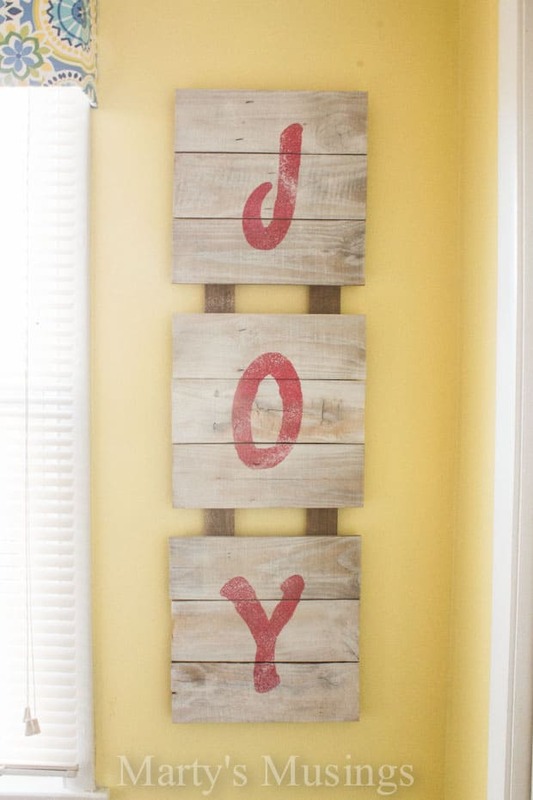 Obviously we love to decorate our home for Christmas with the look of rustic signs! 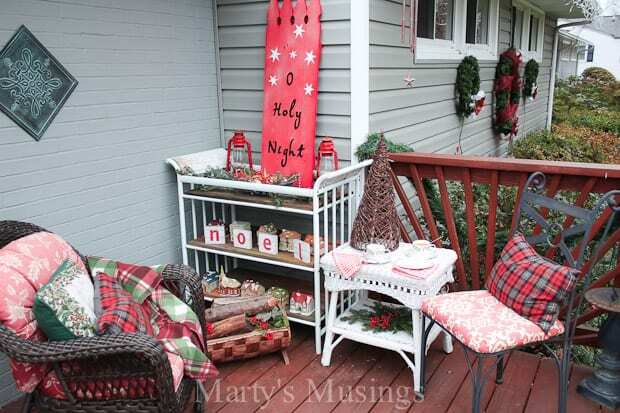 This year I wanted to finally decorate our front deck the way I decorate the inside of our home, with rustic charm and a cozy, come on over y’all, kind of welcome! 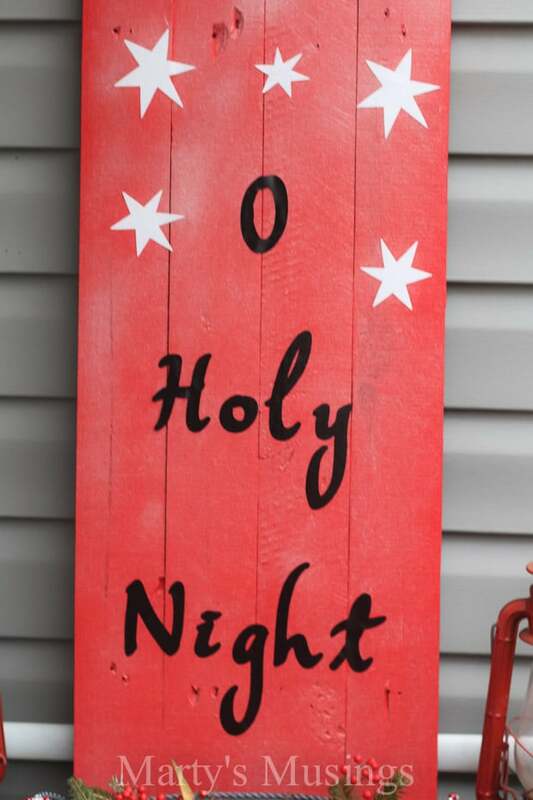 Our O Holy Night project obviously began with Tim selecting fence boards that were relatively uniform to each other. 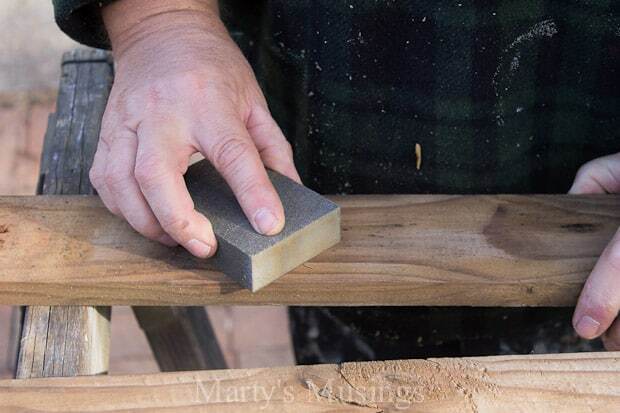 He then cleaned the boards with a cloth and sanded them lightly. He flipped the boards onto their face on saw horses and placed them side by side, clamped them together and glued and screwed on the rear supports. 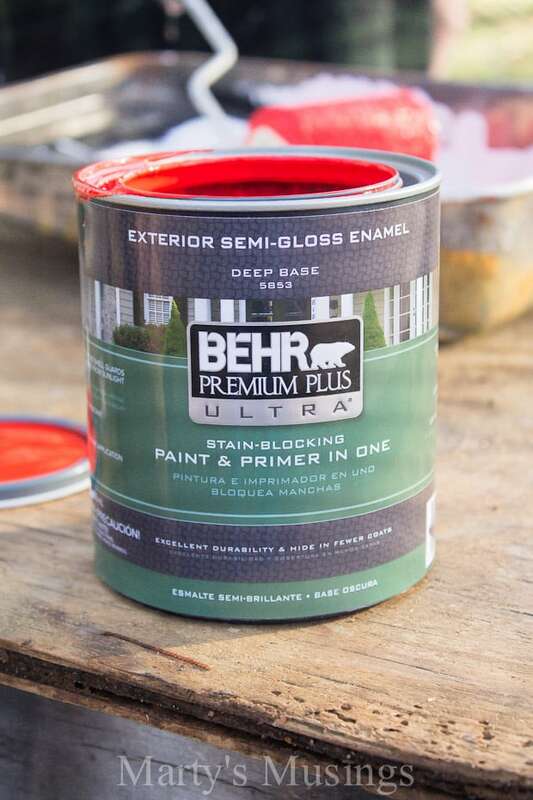 I chose Behr Premium Plus Ultra Exterior Semi-Gloss Enamel #P170-7 100 Mph (that’s the color name) for painting the fence boards. Tim used two coats of the Behr paint to cover the wood. For a little sparkle I then sprayed the boards with Krylon Glitter Blast Diamond Dust. I’m all about a little glitter and bling at Christmas! After Tim finished with his part it was my time to work on the words. 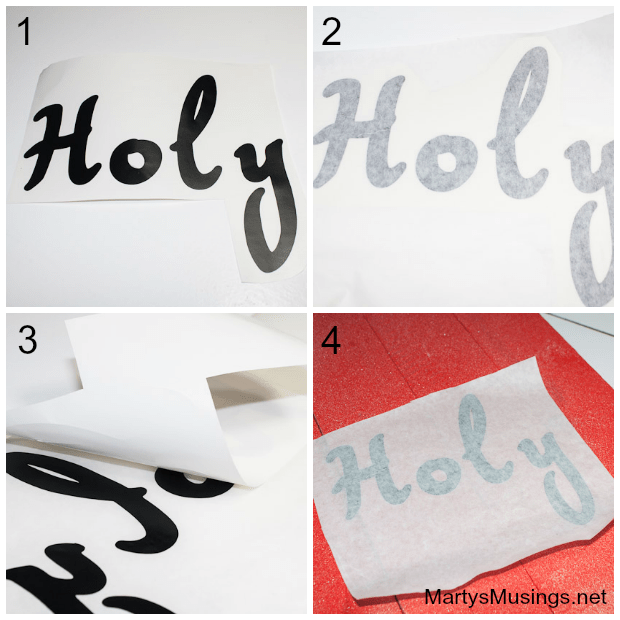 I used my Cricut diecutting machine and chose the Jasmine cartridge for the lettering, set on shadow, 4 1/2″. For the star I used my Accent Essentials cartridge. My go to vinyl for an outdoor project is this product in black and this one in white. I won’t use any other vinyl except Expressions Vinyl. You can see the pictures of the steps below but you’ll need to read all the step by step instructions in this post. Once you get the hang of transferring the letters it’s really not that complicated. 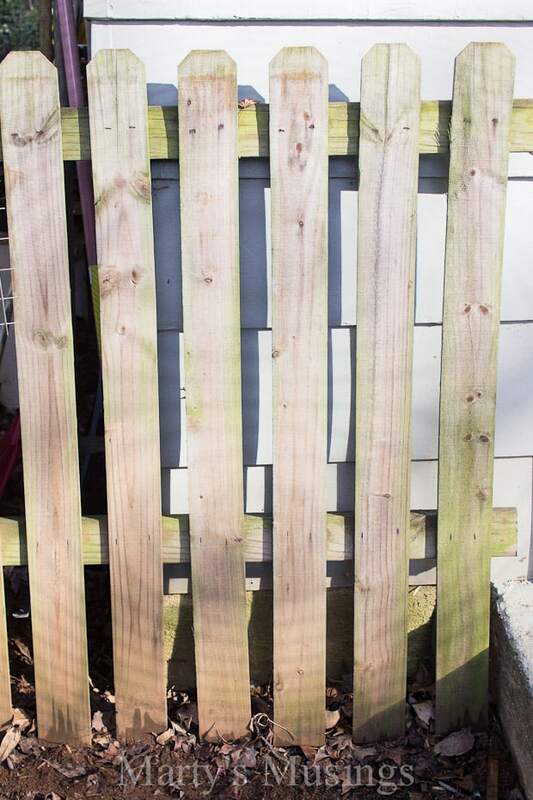 The fence board is a bit trickier because the surface is unpredictable but the beauty of it is its imperfections! 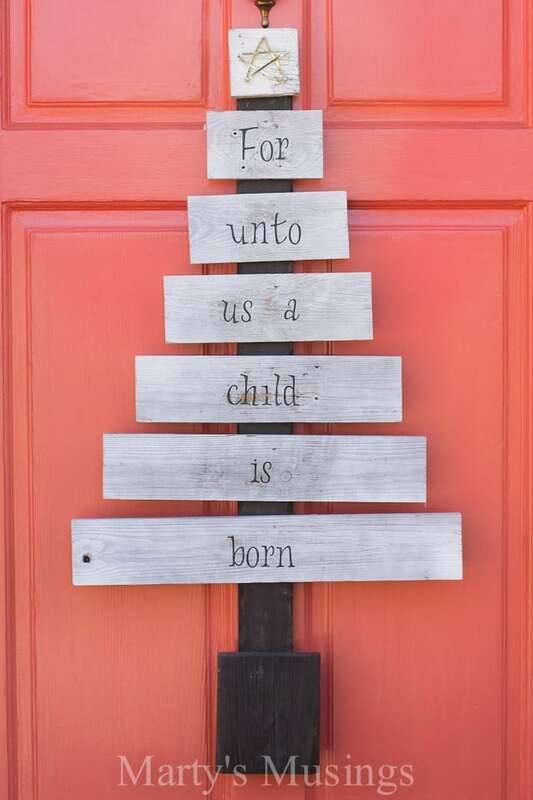 I decided to use the sign on my yard sale changing table turned DIY garden cart all decorated for the season. This inviting little nook on my deck is now ready for guests. Can you see I’ve set a little table for us with those special cookies I was talking about and my favorite Instant Russian tea? 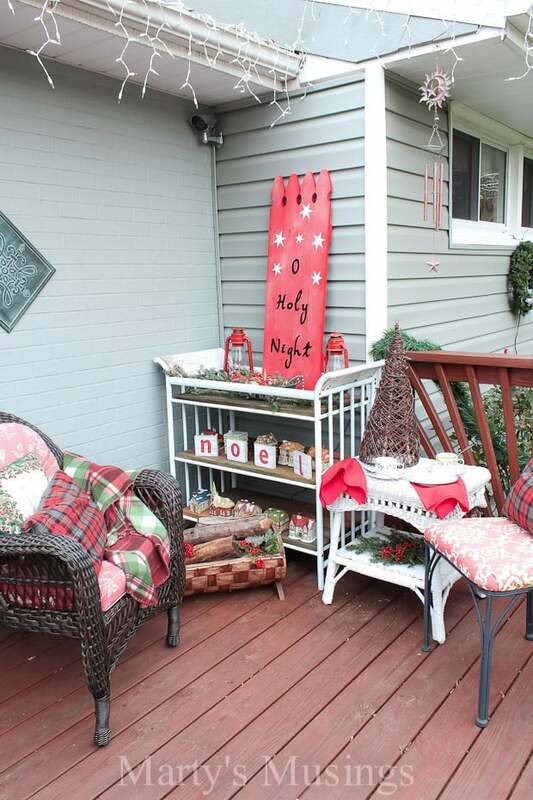 I have much more to show you of my outdoor decorating and more fun Christmas projects and recipes to come! Before then I hope you’ll visit my Behr girls and see their amazing creativity on display! I just love the Symphony Gold color! It is such a beautiful color, I’d love to paint my guest bedroom that color!! 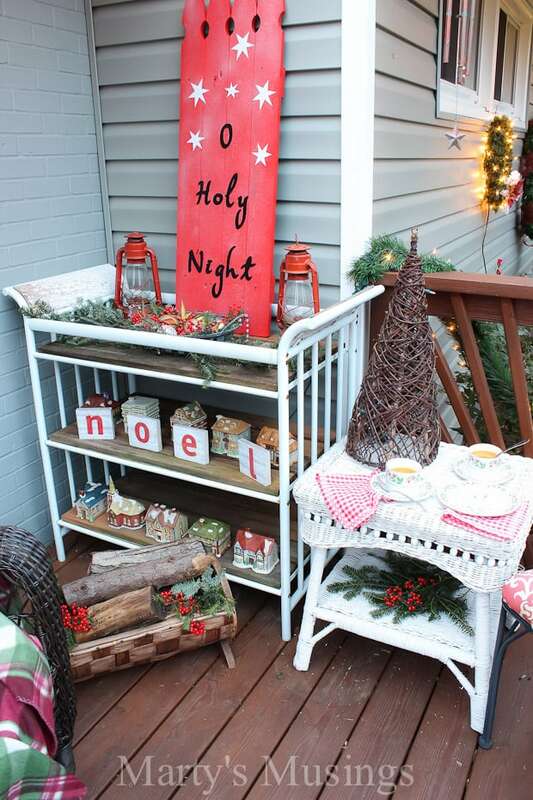 Your little Christmas nook looks beautiful and very inviting! I would love to join you for tea and cookies!!!!! Too bad I live in Michigan!!! Thanks so much for sharing!!! Such a fun project, Marty! Love that it feels just as cozy as inside – and I’m always in favor of a good pop of red. Thanks, Kim! It’s a little bit easier in NC than in the Quad Cities! That’s right isn’t it? That’s where my hubby is from and I lived there one winter. Golly, it was cold with snow on the ground all winter! 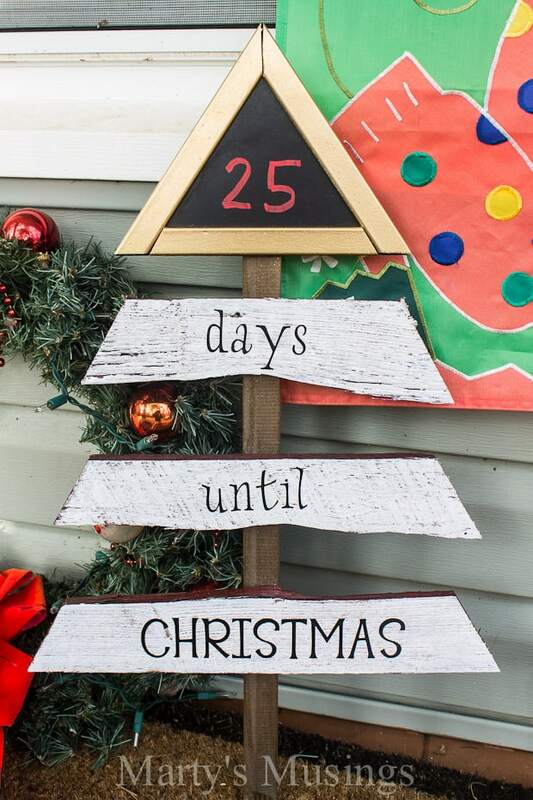 …and I haven’t even put up my indoor decorations yet! This is so charmingly cozy – a real inspiration! Hi, Jen. I haven’t finished my inside or outdoor decorations, either! Don’t feel bad! Wow! Love that bright red, so festive! Beautiful sign. I’m using Majestic Blue as a accent in my house. An accent wall or two and the inside of an arch way. Hi, there! How do you like the Majestic Blue? Right now I’m into gray and coral with a lot of neutral, also some aqua and red. Oh, heck, I like everything! We’re selling in a couple of years, so I’m painting everything neutral colors. It used to have tons of faux painting and lots of colors. The ceiling in my kitchen/ dining room was even blue! The majority of the house is now a neutral beige with a touch of grey in it. I do have the Majestic Blue on an accent wall in my kitchen, but the ceiling is back to a neutral off white, and I think changing the inside of the arch way back to the beige will make it look more open – so that’s on my list of things to do. How festitve! 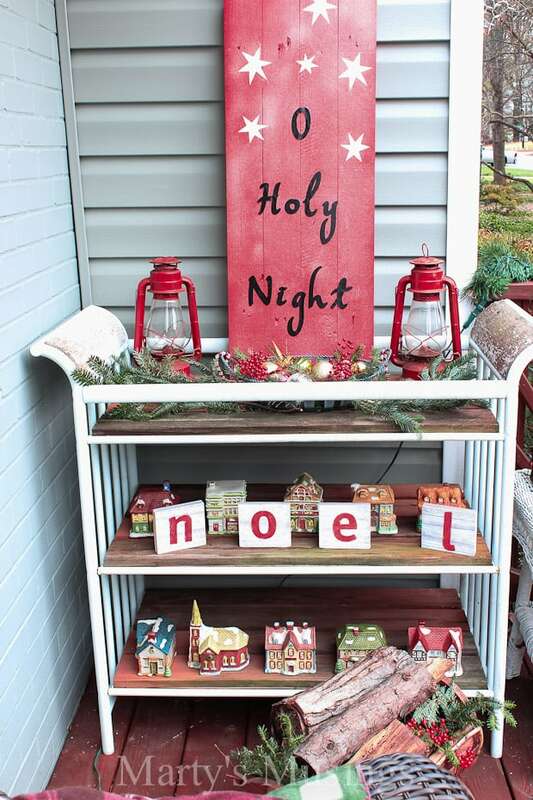 Your whole porch display looks beautiful! Thank you, Jenn! I’ve enjoyed working with you again this year on the Behr campaign! Have a great Christmas! Robin, you’re so sweet and such fun play on words! I’ve enjoyed working with you and Behr again this year! Love the red color for the sign, it is so festive! So many great ideas and I love the fenceboard!! Thanks for sharing on Throwback Thursday and I’ll be pinning this to our TBT pinterest! Hope to see you next time! !